Good Sunday to all of you. Hope the weekend is going great. Remember this great armoire I scored for $50. After some heavy duty sanding by my great handy man Terry we got it down to the bare wood. As you can see my assistant Peggy is checking out the progress! The next process was to take white paint and water it down. I did one part paint to one part water. I just used white paint I had. Nothing fancy like chalk paint etc. just regular paint. 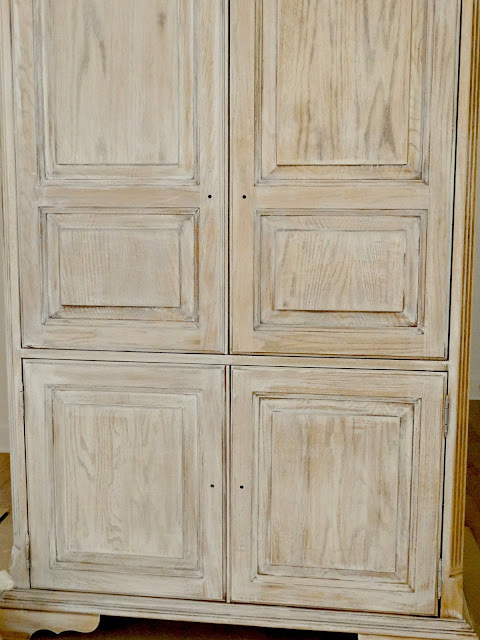 Then I took a wet brush and white washed the paint onto the cabinet. The next step was to take steel wool and rub off the paint. This was after the first round with the steel wool. We did this about 3 more times to get the desired look. I did not follow any rules just kept putting on another coat of white wash and then used steel wool to take off the paint. To get it to the desired look I wanted it was about 3 times of doing this process. Each time the cabinet took on more of the white wash. If you like the french look of the wood really coming through you would only have to do this process one time. I wanted more white on this piece so it would live happily with the other white chippy pieces I have in this room. This is where I ended up after 3 rounds of white wash and using the steel wool. It lets some of the wood show but I get the gray and white effect I wanted. 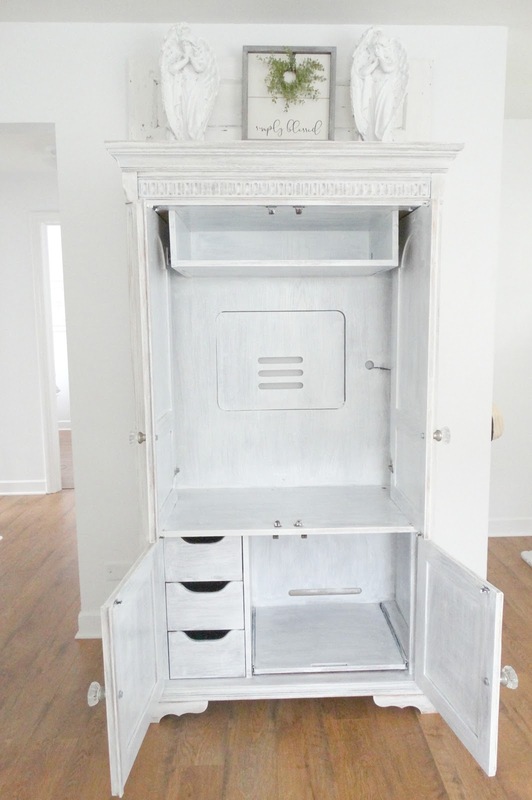 I was going to just paint the inside of this cabinet but after playing around with the steel wool on the inside I kind of liked that it looked much like the outside of the armoire. 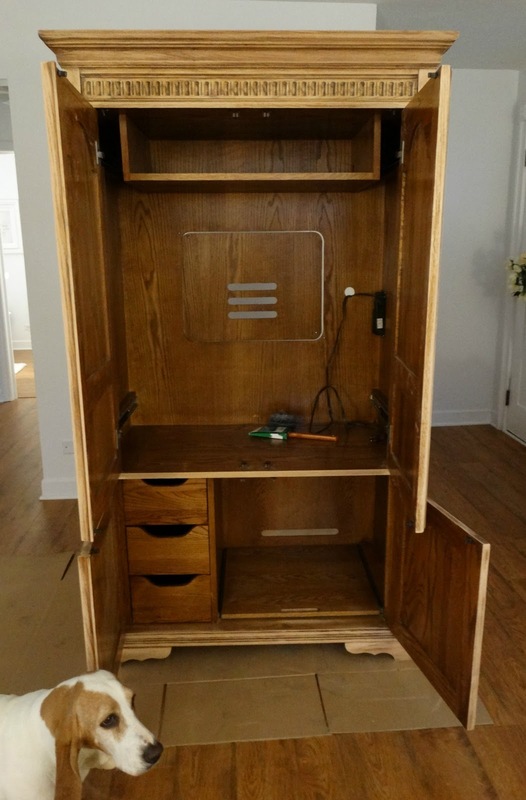 Now I have a small armoire to bring in a small TV for the upstairs and also gives me some storage. I am thinking a cute basket with my throws in that open area next to the drawers. This piece now fits nicely with all my other chippy pieces in the room. It has been a rain filled weekend and no sun. These pictures are a bit drab. If I try to brighten them too much they get washed out. Hoping soon to take pictures of the whole living room reveal. Maybe soon I will have some sunny days to capture this room better. I love your armoire! Especially once you did your magic on it. Rained here last night. Love that you have Peggy for a helper. Just saw this on IG and had to come take a look! I love how it turned out, what a transformation! It will go perfectly with all your heavenly white! I live it Kris! 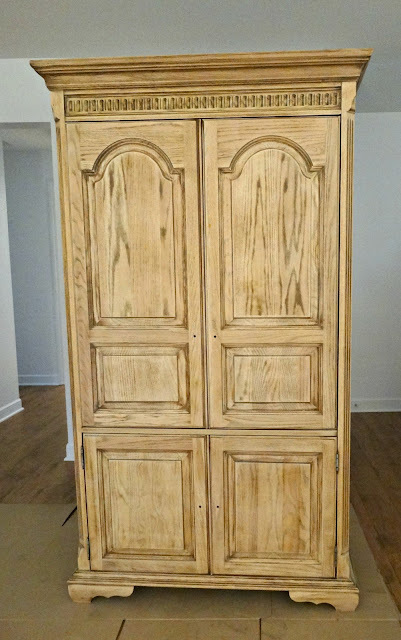 Ran over from IG, and don’t you love when a $50.00 Armoire turns out to be a piece to love. Kris, I am all for storage and throws stacked in the cubbie is great ! 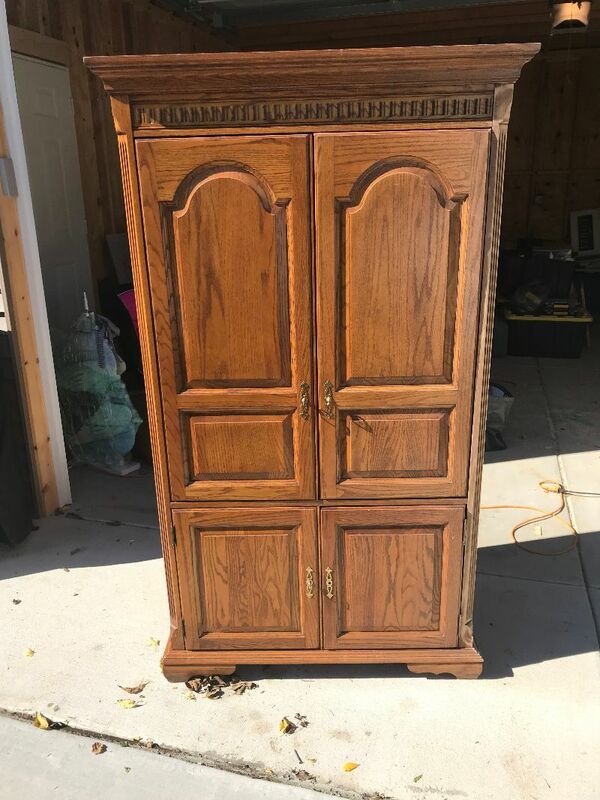 Kris, my Armoire is close to being antique. It’s not a tv unit but was a wardrobe closet, i took off the cheaper backing and screwed on a sheet of T-1-11 ply that’s siding with that planked look to have a solid back to hang a small mirror on when door was open. I painted my darker inside to look deralic like, abandoned and decayed and sanded the exterior much in your méthod. I use mine in my only living space front room that’s small for extra needed storage so it became a library for books and magazines and throws. There tidy behind doors and less cluttered seeing them. It’s a great piece you have added your touch to. And you could even use that cubby space for magazines and or books, easy access to read in bed. Cant wait for the reveal. What 50 bucks, you scored good girl and hubby did a terrific job sanding it down. How are you haven't talked in forever?? It looks fantastic Kris. Always love a good find! Sanding that piece cannot have been easy! I love the look of each stage of your process. You must be thrilled with the result. So much work! So very beautiful in your room. Your armoire is so pretty, Kris! I really love it! I also liked it after one coat, but I think you needed the three coats for your room. Kris, You and Terry are a great pair of hard workers. :) Love the way that looks. It does go well with the other things in the room. You are doing well there. By Christmas season....oh I can't wait !! This turned out beautifully, Kris...a lovely and functional piece! Kris us too another day of gloomy skies... yesterday the heavens opened up with a glorious light as I was changing bedding and yup jumped on posting on IG a shot of that gorgeous October light!!! Today back to rainyness and dark looming skies. You are lucky to have found a pretty and small armoire to work in your space. Our design style is very personal and you embrace your home with what you love and girlfriend you made it into a beautiful piece for your bedroom. Our bedroom armoire is large and houses our large flatscreen an upstairs stereo system and my favorite sweaters. I adorned the inside with a green faux technique to compliment our bedroom walls and on the inside doors I did a black and white checkerboard only 4 design on the top door and the bottom. What is so wonderful about expressing our soul in our home is that our choices are soulful gifts for us to enjoy. Go for it girlfriend feather your nest in the whiteness and beauty that makes your heart happy and makes us all swoon. Your new home is turning into a welcoming nest and Yay for Terry who helps to get you there. Also yes a textural basket with lovely throws and since it is for you and Terry in your bedroom add into the interior personal meaningful things. Nice job! I love the look you achieved. What magic a girl with a paint brush and some watered down paint can create. If I walked into this room, I would immediately know it was yours. 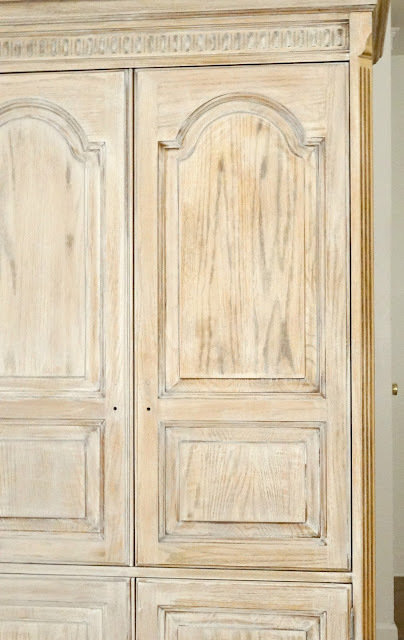 I am curious - did you paint this armoire INSIDE? WOW Kris, this is gorgeous! 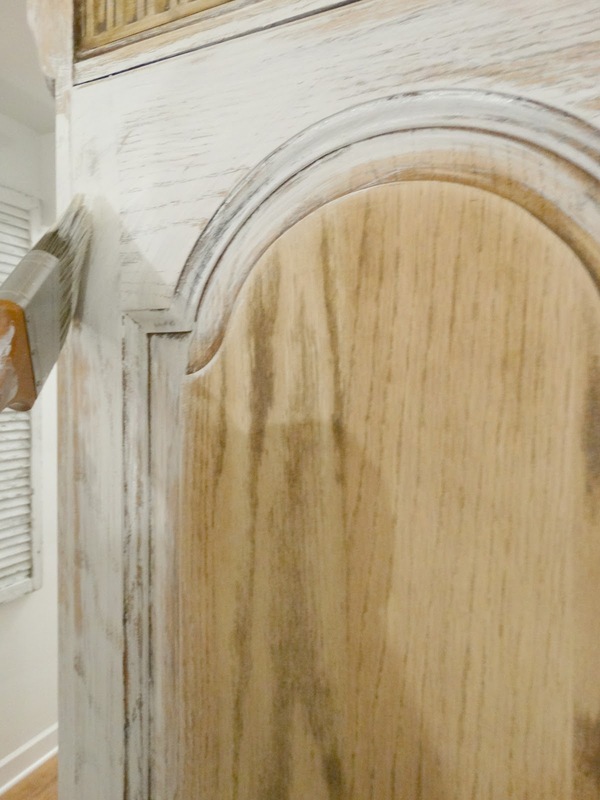 thanks for sharing your process to get that fab finish! Wow, Kris! This is amazing. I love what you have done to it and even more, I love your darling assistant!! You didn't waste any time! Way to go! Give your assistant a pat from me. Sweet Peggy!! What an amazing transformation.. I'm spellbound..
You are my best cheerleader Krishna. Thanks you always for your sweet visits. Have a wonderful week. The armoire looks great with the white wash, Kris. I'm sure, having that cute assistant approving every step, helped a lot! ;) I love that you still can see a little bit of the wood. The cabinet is not only very pretty but also very practical. I hope you're feeling well again. Have a wonderful week! YOU DID IT!!!!!!!!!!!!!!!! It's all coming along so well, Kris! Loving your home? What a super find, Kris! It looks perfect. Great transformation. Looking forward to seeing the entire room. Peggy is so sweet. I hope she's doing well post-surgery, and eating ok. This turned out beautifully! I really like the texture and dimension your technique gave it! Bravo! Hugs! Kris, I love how this turned out. I love French and the wa y this turned out I think it works for French too. Just my opinion I'm sure. I love it and you got a great deal. I also like what you did with it. I am going to keep an eye out for one. That came out great! I like that it's multi-functional too! Oh my! It turned out beautifully! I am tucking this info away as a way to refinish some pieces I have! Plus, I'm wanting a storage cabinet for the studio and an armoire is exactly what I've been thinking of getting. I can't tell you how excited this makes me and starts ideas spinning through my head. Your photos still look amazing - I'm looking forward to the final reveal! Another lovely addition to Cottage III - looking forward to seeing the room reveal. Have a great week, Kris! That's a lot of elbow grease to achieve the perfect look! Beautiful transformation! You and Terry make quite the team. Can't wait to see the finished room! One of the best $50 spent I’ve ever seen, but after you work your magic I’d expect nothing less. It is fantastic...such a great piece for such a great price. Very pretty! What a steal! Your hard work really payed off. It looks so pretty...Storage in a small home is sparse at least here at the Charmer. Peggy looks like she makes a great supervisor keeping an eye on all the work. That is a great piece! 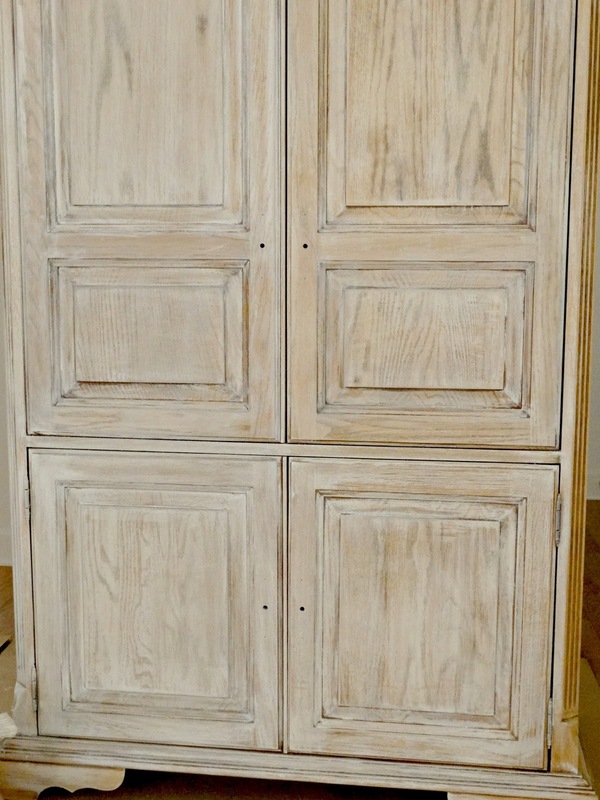 Armoires are always a great storage piece in a room since you can both display things and hide things. Love the whitewash finish too. That looks really nice painted. You did an amazing job, and let's face it, who doesn't need/want more storage!!! Those drawers are perfect for DVD's! 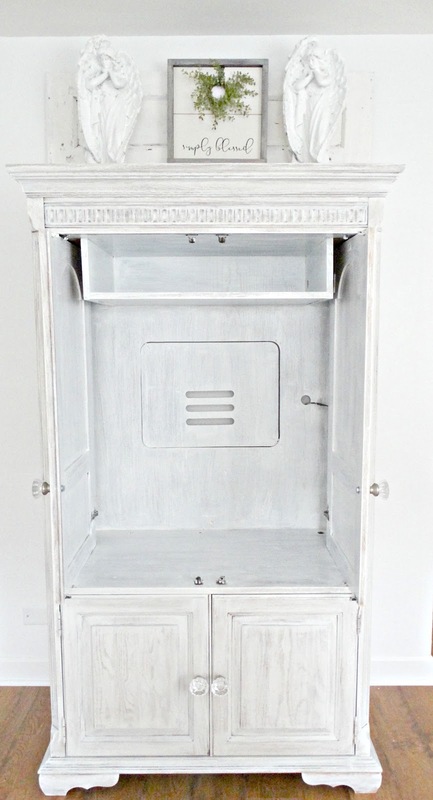 The transformation is amazing!....what a perfect piece for the room giving you so many uses! Yes a basket in that area would look wonderful! 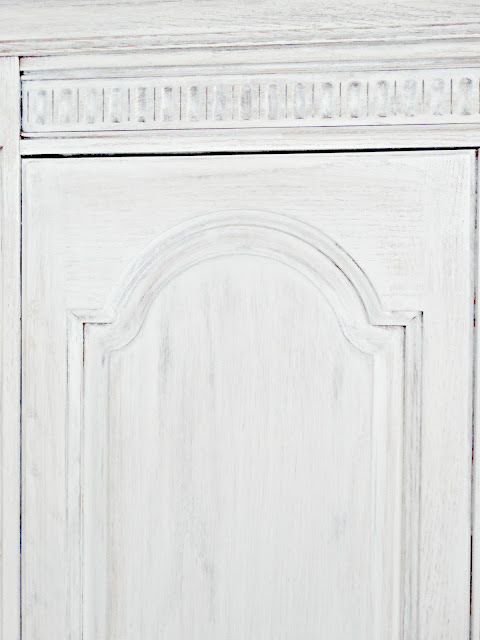 Love the whitewash finish too. This looks fantastic, Kris! lots of work, but so worth the process! LOVE it!! 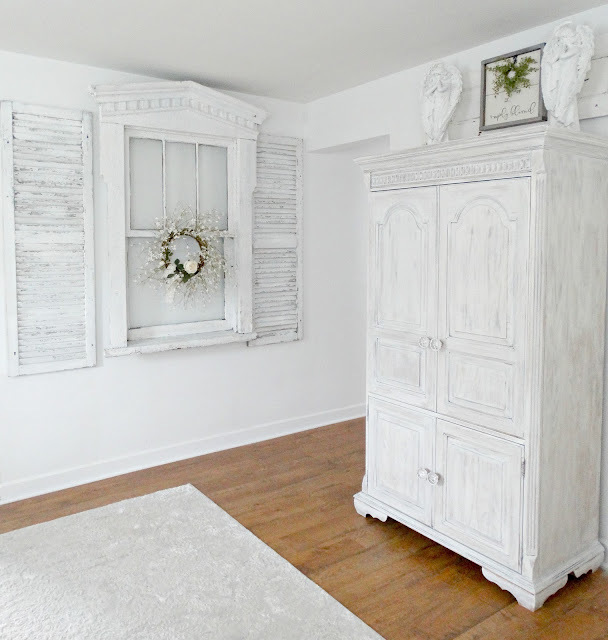 The armoire looks beautiful in white! It goes perfectly well with your decor. Fabulous piece. What a wonderful transformation.